Tonight (July 20) is a big night for the late Whitney Houston's daughter, Bobbi Kristina. The young up-and-coming actress is set to make her big debut on Tyler Perry’s sitcom 'For Better Or Worse’ on TBS. So many have doubted Kristina's acting skills, and rumors have even circulated around her storming off set before the show was complete. 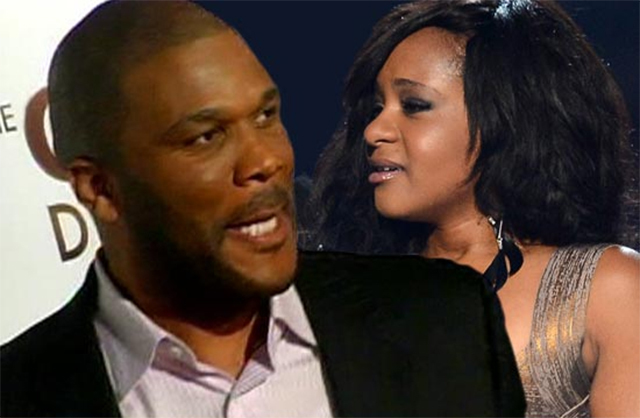 Tyler Perry has since denied those rumors, and is now having a serious change of heart about how he feels how good Kristina really is.”BOY WAS I WRONG!,” he said. Ok, with my heart and soul I will help and child, just as I tried to do for Whitney. So with that said, one thing I knew that Krissi would need after Whitney’s death was a safe place to grieve. So when she told me she wanted to act I said I would help. If she had said she wanted to be a doctor I would have tried to help her get into the best schools. But because she said acting, that was easy for me. I thought, this is great. This way I could have her on the show, while at the same time be there for her and help her walk through this grief. So I wrote her into For Better Or Worse, which airs tonight on TBS. Now I wrote a very small part because I wasn’t sure if she could act. She had never done it before. So needless to say I was a little cautious, but BOY WAS I WRONG! Krissi was so good in that small part that I went back and wrote major scenes for her and even one entire show around her character. I’m so proud of this kid. You have no idea. SO PROUD OF HER! I know Whitney is smiling down on her baby girl. Here’s what I’d like you to help me with if you don’t mind. It is one of my heart’s desires to see Krissi happy and joyous and moving through the pain of this tragedy. I know that the news media has moved on but the pain is still very real to her. What I also know is that every little bit of sunshine can help her move through. Trust me, I know. You helped me move through the grief of my mother’s death. So if you will, after you watch Krissi’s performance on For Better Or Worse tonight on TBS, please post a comment on my message board letting her know what you thought. She’s been through hell, and to see her smile melts my heart. So I know if she reads your comments she will be even more inspired. And you better believe she’ll be watching and reading…LOL. You know how these teenagers are with the internet. Lastly, if you will whisper a prayer for her and the Houston family I know that they would appreciate it. Most of you have no idea what it’s like to lose a mother, especially at 19. I’m 42 and it still brings me to my knees at times. Be well, God bless and I’ll be reading tonight.